Today, lots of companies are interested in increasing sustainability and implementing sustainability programs. Some companies are striving for even more, aiming for ‘Zero Waste‘. 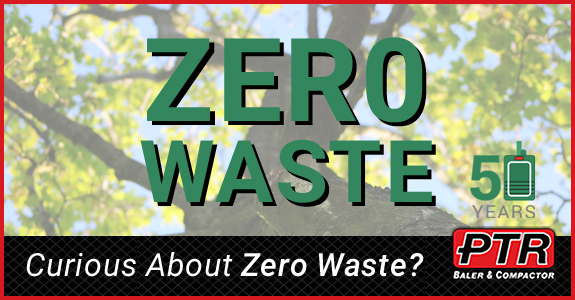 PTR’s top of the line balers and compactors can help you achieve your Zero Waste goal by turning what was once considered trash into valuable recycling commodities. Cardboard, paper, plastics, shrink wrap, and aluminum can all be diverted from the landfill, increasing sustainability and creating a new revenue stream. Many baler and compactor models are available. Our customer service representatives are happy to answer all of your questions, so you can be sure you’ll get the one that’s right for you company. The more organizations embrace Zero Waste and other sustainability policies, the closer we will come to creating a healthier, greener earth for future generations. Now is the time to make these changes and put these sustainability endeavors into action. Your company’s primary goal should be to avoid sending waste to the landfill as completely as possible. From there, you’ll seek to proactively reduce, reuse and recycle any and all waste. When none of these are feasible, donation is another option. Sustainability can be a challenge for large corporations and small businesses alike, but Zero Waste is a major commitment. It all starts with dedication. Getting management and employees on board is a critical step. You’ll need to create a concise plan of how you are actually going to make it happen, and then see it through each day. It’s not always easy, but the difference you’ll be making will be well worth it. UL recommends that you consider these 3 ‘Steps to Waste Diversion’ before implementing your policy. The first step is ‘Understanding’ current waste streams and what their estimated volumes are. Next, ‘Measuring’. Set your goals and figure out your action plan on how you will eliminate waste going to the landfill. Lastly, ‘Rerouting’. One diversion practice allows you to 1) re-route waste to other facilities that will use it as a raw material 2) send to recycling plant 3) use towards production of energy.